Our incoming class reflects the great diversity of our state and nation. President Cauce and Dubs welcome students at the 2017 President’s Picnic. This year we welcome our largest-ever incoming class, which includes the most students from Washington state in our University’s history. It says something very special about the University of Washington that we have drawn such a large and talented new class when many colleges and universities around the country are experiencing a decline in enrollment. 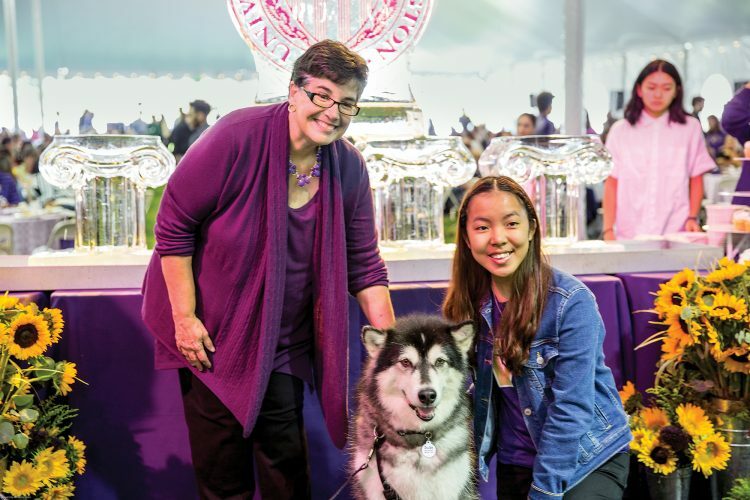 Our exceptional faculty, the breadth and depth of our programs, and the undeniable success stories of our alumni have made the UW a highly sought place to pursue a degree. The heart of our great public mission is creating access to excellence for the most promising students, and with each new class we welcome, we have the opportunity to honor that mission. As the leader of an institution that cultivates and nurtures the incredible potential of our students, I am especially pleased that our incoming class reflects the great diversity of our state and nation. Nearly a third of this incoming class will be the first in their families to earn a four-year degree. We are committed to the ongoing work of increasing equity and making inclusion an intrinsic part of our culture, because we insist on excellence. Thanks to the generosity of supporters like you, we can continue to ensure that financial challenges are never a barrier to attending the UW, regardless of a student’s background or income. Your support makes it possible for first-year student Ruth Mulugeta, who graduated from Seattle’s Cleveland High School, to pursue her dream of curing cancer, and it enables the UW to offer her the learning experiences, inside and outside the classroom, that can help make her dream a reality. Your support also makes it possible for Chelsea Li to transfer to the UW from Spokane Community College as she works to become the first in her family to earn a bachelor’s degree. You help make it possible for Victor Gill to explore his interest in forensic science by taking the “CSI: Seattle” course through our Early Fall Start program. And your support ensures that the professional and graduate students—our future physicians, researchers, social workers, attorneys and innovators—can earn the degrees and expertise that our society relies upon. As supporters, fans and alumni, you are a key ingredient in our public promise. You light the way for students just starting on their journey, and you lift them up in countless ways as they discover their passions and pathways. Thank you for all that you do for our University and for this new generation of Huskies.